God promised that if the people obeyed him they would be free from diseases that plagued the Egyptians. Little did they know that many of the moral laws he later gave them were designed to keep them free from sickness. For example, following God’s law against prostitution would keep them free of venereal diseases. God’s laws for us are often designed to keep us from harm. Men and women are complex beings. Our physical, emotional and spiritual lives are intertwined. Modern medicine is now acknowledging what these laws assumed. If we want God to care for us, we need to submit to his direction for living. 1 Then Moses and the Israelites sang this song to the LORD: “I will sing to the LORD, for he has triumphed gloriously; horse and rider he has thrown into the sea. 2 The LORD is my strength and my might, and he has become my salvation; this is my God, and I will praise him, my father’s God, and I will exalt him. 4 “Pharaoh’s chariots and his army he cast into the sea; his picked officers were sunk in the Red Sea. 6 Your right hand, O LORD, glorious in power — your right hand, O LORD, shattered the enemy. 7 In the greatness of your majesty you overthrew your adversaries; you sent out your fury, it consumed them like stubble. 8 At the blast of your nostrils the waters piled up, the floods stood up in a heap; the deeps congealed in the heart of the sea. 9 The enemy said, ‘I will pursue, I will overtake, I will divide the spoil, my desire shall have its fill of them. 10 You blew with your wind, the sea covered them; they sank like lead in the mighty waters. 11 “Who is like you, O LORD, among the gods? Who is like you, majestic in holiness, awesome in splendor, doing wonders? 13 “In your steadfast love you led the people whom you redeemed; you guided them by your strength to your holy abode. 14 The peoples heard, they trembled; pangs seized the inhabitants of Philistia. 15 Then the chiefs of Edom were dismayed; trembling seized the leaders of Moab; all the inhabitants of Canaan melted away. 16 Terror and dread fell upon them; by the might of your arm, they became still as a stone until your people, O LORD, passed by, until the people whom you acquired passed by. 17 You brought them in and planted them on the mountain of your own possession, the place, O LORD, that you made your abode, the sanctuary, O LORD, that your hands established. 22 Then Moses ordered Israel to set out from the Red Sea, and they went into the wilderness of Shur. They went three days in the wilderness and found no water. 23 When they came to Marah, they could not drink the water of Marah because it was bitter. That is why it was called Marah. 25 He cried out to the LORD; and the LORD showed him a piece of wood; he threw it into the water, and the water became sweet. There the LORD made for them a statute and an ordinance and there he put them to the test. Certainly holidays were instituted by God himself. Passover was a holiday designed to celebrate Israel’s deliverance from Egypt and to remind the people of what God had done. Passover became an annual remembrance of how God delivered the Hebrew from Egypt. Each of the people would pause to remember the day when the destroyer (God’s angel of death) passed over their homes. They gave thanks to God for saving them from death and bringing them out of the land of slavery and sin. 7 They shall take some of the blood and put it on the two doorposts and the lintel of the houses in which they eat it. 11 This is how you shall eat it: your loins girded, your sandals on your feet, and your staff in your hand; and you shall eat it hurriedly. It is the passover of the LORD. 13 The blood shall be a sign for you on the houses where you live: when I see the blood, I will pass over you, and no plague shall destroy you when I strike the land of Egypt. 27 you shall say, ‘It is the passover sacrifice to the LORD, for he passed over the houses of the Israelites in Egypt, when he struck down the Egyptians but spared our houses. '” And the people bowed down and worshiped. 42 That was for the LORD a night of vigil, to bring them out of the land of Egypt. That same night is a vigil to be kept for the LORD by all the Israelites throughout their generations. Let’s pray: Lord our redeemer and savor, we give ourselves to you fully. We fully acknowledge that you sacrificed your son Jesus Christ so that we may be freed from the deadly consequences of our sins. Through your son’s sacrifice a relationship between us (God and We) has been established. We pray to be committed and bounded to this new formed relationship and be truly yours and yours forever. Amen. 2 This month shall mark for you the beginning of months; it shall be the first month of the year for you. 3 Tell the whole congregation of Israel that on the tenth of this month they are to take a lamb for each family, a lamb for each household. 4 If a household is too small for a whole lamb, it shall join its closest neighbor in obtaining one; the lamb shall be divided in proportion to the number of people who eat of it. 5 Your lamb shall be without blemish, a year-old male; you may take it from the sheep or from the goats. 6 You shall keep it until the fourteenth day of this month; then the whole assembled congregation of Israel shall slaughter it at twilight. 8 They shall eat the lamb that same night; they shall eat it roasted over the fire with unleavened bread and bitter herbs. 9 Do not eat any of it raw or boiled in water, but roasted over the fire, with its head, legs, and inner organs. 12 For I will pass through the land of Egypt that night, and I will strike down every firstborn in the land of Egypt, both human beings and animals; on all the gods of Egypt I will execute judgments: I am the LORD. 13 The blood shall be a sign for you on the houses where you live: when I see the blood, I will pass over you, and no plague shall destroy you when I strike the land of Egypt. 16 On the first day you shall hold a solemn assembly, and on the seventh day a solemn assembly; no work shall be done on those days; only what everyone must eat, that alone may be prepared by you. 17 You shall observe the festival of unleavened bread, for on this very day I brought your companies out the land of Egypt: you shall observe this day throughout your generations as a perpetual ordinance. 18 In the first month, from the evening of the fourteenth day until the evening of the twenty-first day, you shall eat unleavened bread. 19 For seven days no leaven shall be found in your houses; for whoever eats what is leavened shall be cut off from the congregation of Israel, whether an alien or a native of the land. 21 Then Moses called all the elders of Israel and said to them, “Go, select lambs for your families, and slaughter the passover lamb. 22 Take a bunch of hyssop, dip it in the blood that is in the basin, and touch the lintel and the two doorposts with the blood in the basin. None of you shall go outside the door of your house until morning. 23 For the LORD will pass through to strike down the Egyptians; when he sees the blood on the lintel and on the two doorposts, the LORD will pass over that door and will not allow the destroyer to enter your houses to strike you down. 24 You shall observe this rite as a perpetual ordinance for you and your children. 25 When you come to the land that the LORD will give you, as he has promised, you shall keep this observance. 29 At midnight the LORD struck down all the firstborn in the land of Egypt, from the firstborn of Pharaoh who sat on his throne to the firstborn of the prisoner who was in the dungeon, and all the firstborn of the livestock. 30 Pharaoh arose in the night, he and all his officials and all the Egyptians; and there was a loud cry in Egypt, for there was not a house without someone dead. 31 Then he summoned Moses and Aaron in the night, and said, “Rise up, go away from my people, both you and the Israelites! Go, worship the LORD, as you said. 37 The Israelites journeyed from Rameses to Succoth, about six hundred thousand men on foot, besides children. 38 A mixed crowd also went up with them, and livestock in great numbers, both flocks and herds. Egypt and could not wait, nor had they prepared any provisions for themselves. 40 The time that the Israelites had lived in Egypt was four hundred thirty years. 41 At the end of four hundred thirty years, on that very day, all the companies of the LORD went out from the land of Egypt. 45 no bound or hired servant may eat of it. 46 It shall be eaten in one house; you shall not take any of the animal outside the house, and you shall not break any of its bones. 47 The whole congregation of Israel shall celebrate it. 49 there shall be one law for the native and for the alien who resides among you. 50 All the Israelites did just as the LORD had commanded Moses and Aaron. 51 That very day the LORD brought the Israelites out of the land of Egypt, company by company. The book of Exodus is named after the focus of the first fifteen chapters of the book: the liberation of Israel from Egypt by “the God of Abraham… Isaac, and… Jacob” (3.15). 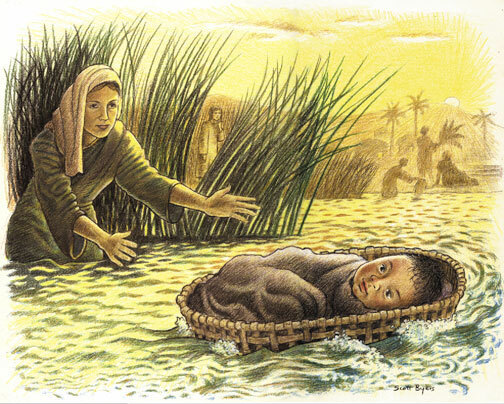 The Exodus, however, is not a goal until itself; the book continues with various laws which distinguish the community (chs 20-23, 34), as well as the instructions for the construction of the tabernacle (chs 25-40), which are narrated in great detail, and assure that a holy God will reside among the people. Pharaoh was afraid the Israelites were becoming so numerous that they would organize and threaten his kingdom, so he made them slaves and oppressed them to kill their spirit and stop their growth. The Egyptians tried to wear down the Hebrew people by forcing them into slavery and mistreating them. Instead the Hebrews multiplied and grew stronger. When we are burdened or mistreated, we may feel mistreated. Our burdens can make us stronger and develop qualities in us that will prepare us for the future. We cannot be overcomers without troubles to overcome. Be true to God in the hard times because even the worst situations can make us better people. Let’s Pray: Gracious God, we commit ourselves to you. Transform us and help us to truly be your children. Let the hardships and troubles bring out the best in us and we never lose your site during our testing times. Provide us the strength to obey you rather than the men. We offer this prayer to you in the name of our Lord and savior Jesus Christ. Amen. 5 The total number of people born to Jacob was seventy. Joseph was already in Egypt. 6 Then Joseph died, and all his brothers, and that whole generation. 7 But the Israelites were fruitful and prolific; they multiplied and grew exceedingly strong, so that the land was filled with them. 9 He said to his people, “Look, the Israelite people are more numerous and more powerful than we. Pithom and Rameses, for Pharaoh. 12 But the more they were oppressed, the more they multiplied and spread, so that the Egyptians came to dread the Israelites. were ruthless in all the tasks that they imposed on them.